World Theatre Day is an annual celebration of everything related to the stage. Started in 1961 by the International Theatre Institute, each year various national and international theatre events are organized to mark this occasion. Theatre captures the essence of our societies, our traditions, and our culture better than perhaps any other art-form, and though performances end, plays live on for as long as they are loved and cherished. They are preserved through repetition, or described in books, or captured on film and stored in archives. These documents; be it the plays themselves, or everything that surrounds them, are an important part of our history. We’re proud to present these memories from the past, now made available again though EUscreen. We hope you’ll enjoy these few fun and interesting clips about European theatre from the last few decades! Feel free to search our collection for plenty more videos about theatre, dance and performance, on EUscreen.eu! The great actor talks about his life, profession and his passion for painting. 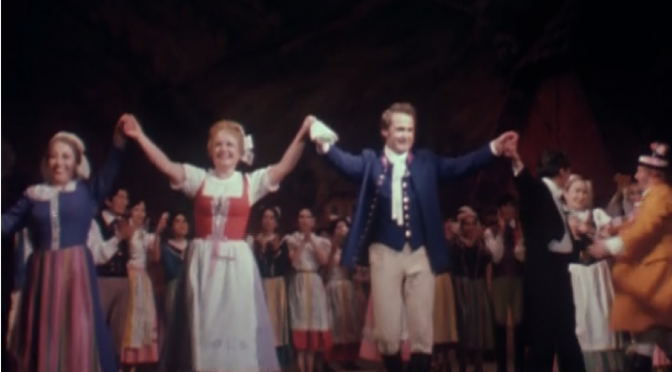 Footage of actress Nadja Tiller with her parents on her visit to Vienna in 1960. Dame Peggy Ashcroft, one of Britain’s top stage actresses, on why she chose the theatre over TV. Radu Beligan talks about the tournament of the Comedy Theatre in Paris. Current trends in contemporary Polish theater. Theater actress Halina Winiarska about her life and career. Dario Fo stages Molière’s “The Flying Doctor” at the Comédie Française, in the tradition of the Commedia dell arte. Eugène Ionesco on his youth spent between Romania and France, his theatre works, and the meaning of the word “absurd”. The creation of the Centre Dramatique de l’Est in 1947 is testimony to the decentralization of the theatre after the war, and this theatre continues to thrive. Backstage at the Theatre of the Czechoslovak Army where the actors are preparing for a performance, and an extract from the play “War with the Newts” by Pavel Kohout. The State Theatre of Opera and Ballet in Ulaanbaatar, Mongolia, presents the opera “The Bartered Bride”. A program about the entrance auditions at the Theater Institute in Barcelona. A captivating performance by ballet dancer Česlovas Žebrauskas. Ballet dancer Aliodija Ruzgaitė performs choreographic miniatures full of humour and charm. Actor Herbert Fritsch stages “Hamlet” in Berlin as an interactive play, making Berlin’s Volksbühne the first German theater to combine theater with the Internet. Robert Ciulli stages a co-production of the Theater an der Ruhr and the Dramatic Arts Center in Tehran. It is the first Iranian-European co-production in 20 years. A performance of the puppet theatre play “Žogica Marogica”. Puppets, puppeteers and a glimpse of what is happening under the stage.